It hasn’t been long that Mercedes unveiled its ‘supersonic’ GLE 63 Coupe, and in this no time auto tuner Brabus engineers got their eyes over this. This is how the Brabus Mercedes GLE 63 Coupe 2015 gets into the automotive industry. After all the tuning program, the model gets more power through increased engine displacement, aggressive looks and superior touch of the tuner. 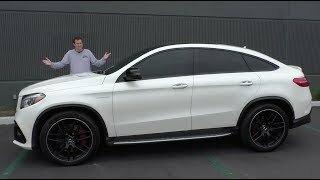 Let us have a look at the review of Brabus Mercedes GLE 63 Coupe 2015 to know more about it. 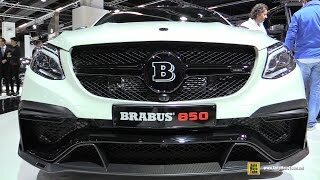 To reach the desired target the first milestone for the tuning company while creating the Brabus Mercedes GLE 63 Coupe 2015 was to increase the displacement and to be mentioned they commendable achieved it. The 5.5 liter now gets 6.0 through the larger forged pistons that tuner installed after boring the cylinders to 4 in. Not only this they also added a special billet crankshaft of 3.8 in and just like above forged longer piston rods. The enhancement program further continues with Brabus 850 intake module which is designed especially for this model and is made from carbon with a new air filter. There is one more conversion in the engine and it is with the 3 in thick down pipes a new exhaust system made from stainless steel and provides active sound management which can be controlled by driver from his seat. 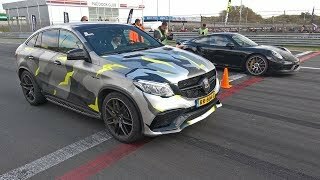 Thus rounding up the details of creating the Brabus Mercedes GLE 63 Coupe 2015 we would say, it has everything to make your Brabus Mercedes GLE 63 Coupe riding experience beyond-comparison. Through its newly enhanced 6.0 liter Biturbo V8, Brabus Mercedes GLE 63 Coupe 2015 now produces total output of 850 hp and peak torque of 1450 nm. With this whooping power rolling its 21 inch massive wheels, the top speed of Brabus Mercedes GLE 63 Coupe 2015 can touch the mark of 200 mph (electronically limited) and can sprint from 0-62 mph in just 3.8 seconds.